1984: MARVEL UK SUMMER SPECIALS HOUSE AD. 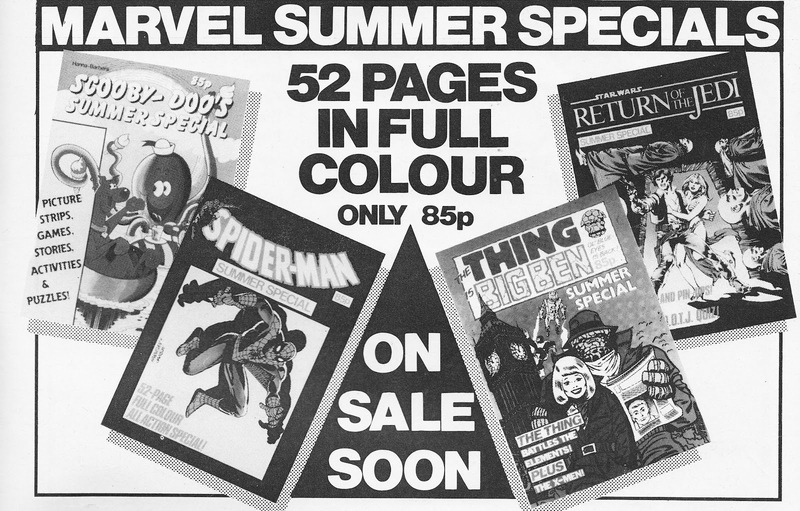 Here's a MARVEL UK half-page House Ad for their four 1984 SUMMER SPECIALS. They appeared in the card-cover, colour interior album format (hence the relatively high cover price). 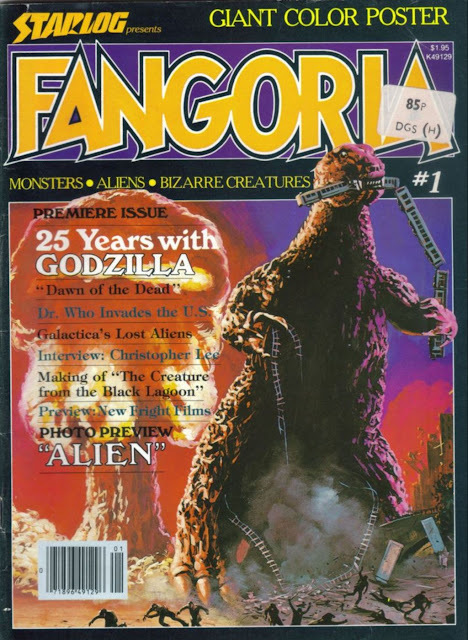 FANGORIA is the great survivor of genre magazines. 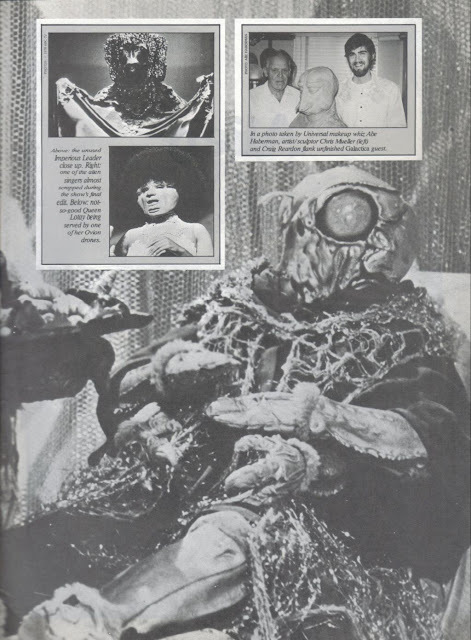 Spun-off from STARLOG in 1979, it hastily dumped its poorly-recieved 'fantasy' remit to become the pure horror magazine we're all familiar with. At the height of the Starlog Group's success it spawned several spin-off titles and - when the magazine market went south - dodged bankruptcy several times, outlasting Starlog itself. It's still published today. Here's a few selected pages from that first issue. 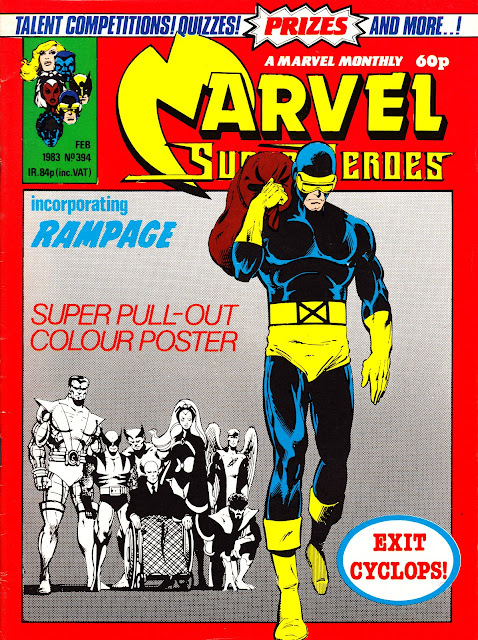 I've picked-out (shocker!) the BATTLESTAR GALACTICA related items ("we're as mad as frack, and we won't take it any more!") including the article on Battlestar's 'lost' aliens which isn't as revelatory as the title might suggest. 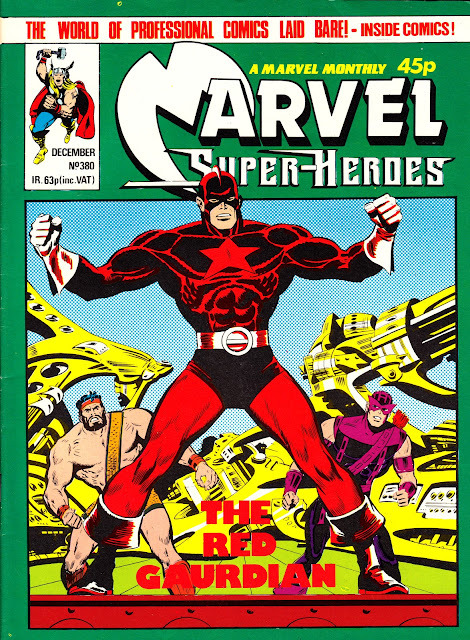 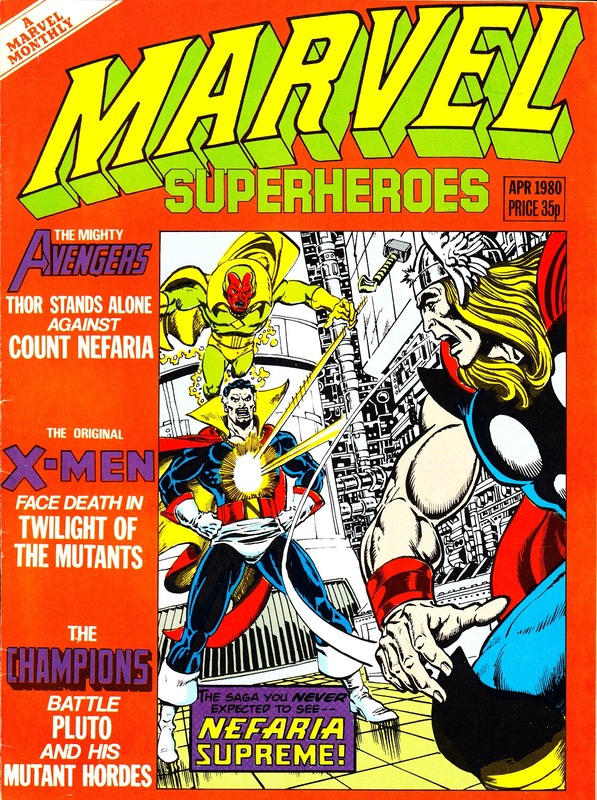 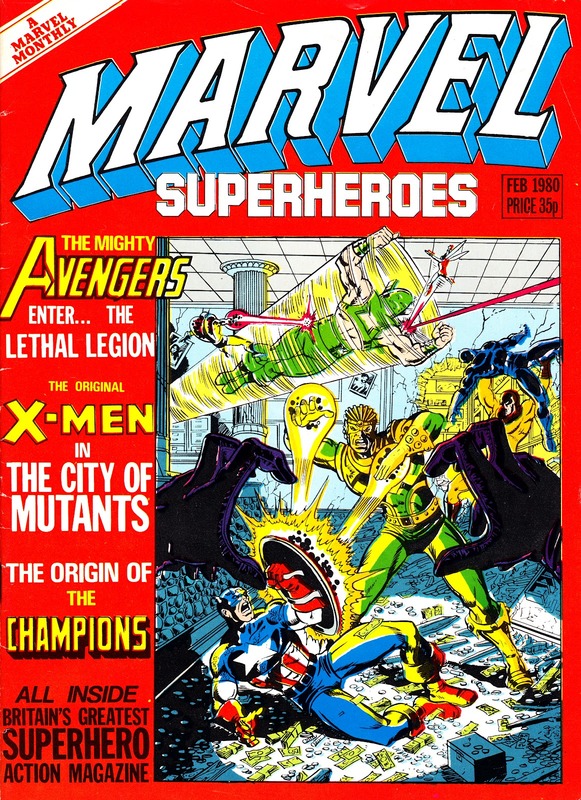 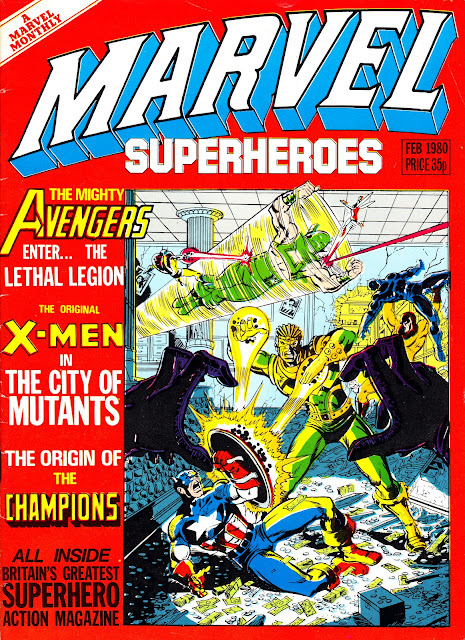 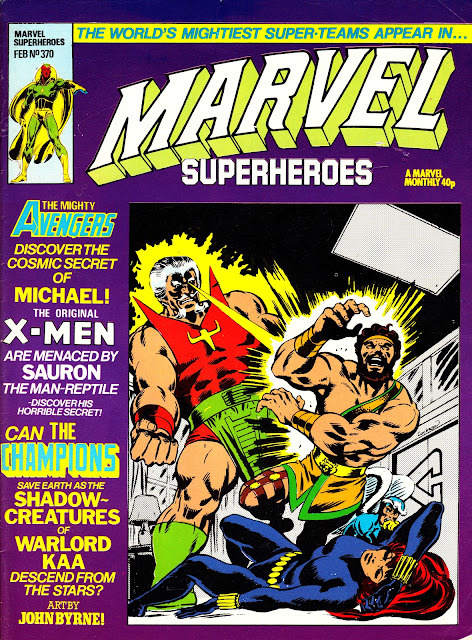 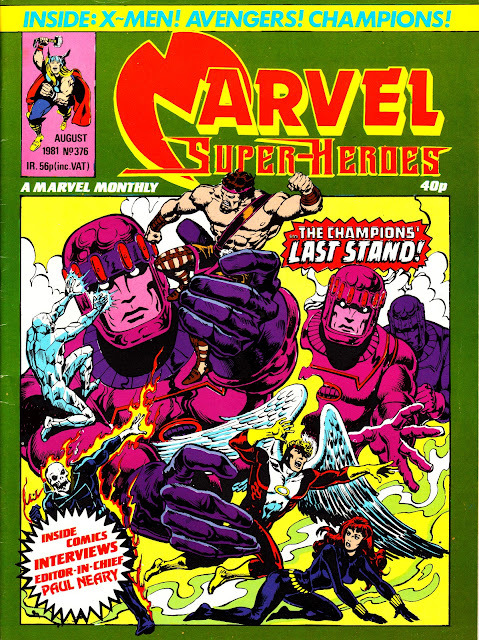 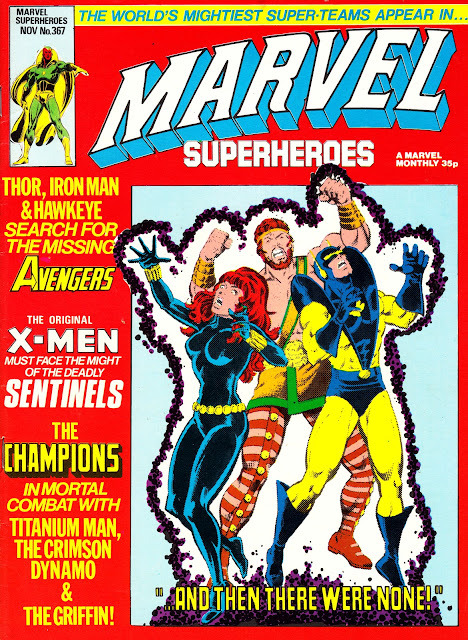 Here's the last part of my MARVEL SUPERHEROES Cover Gallery spanning 1982-83. Unfortunately, this entry is pretty patchy as I have some gaps in this latter part of the run and I apologise for that. If anyone has the missing copies to flog - at a reasonable price - please get in touch. 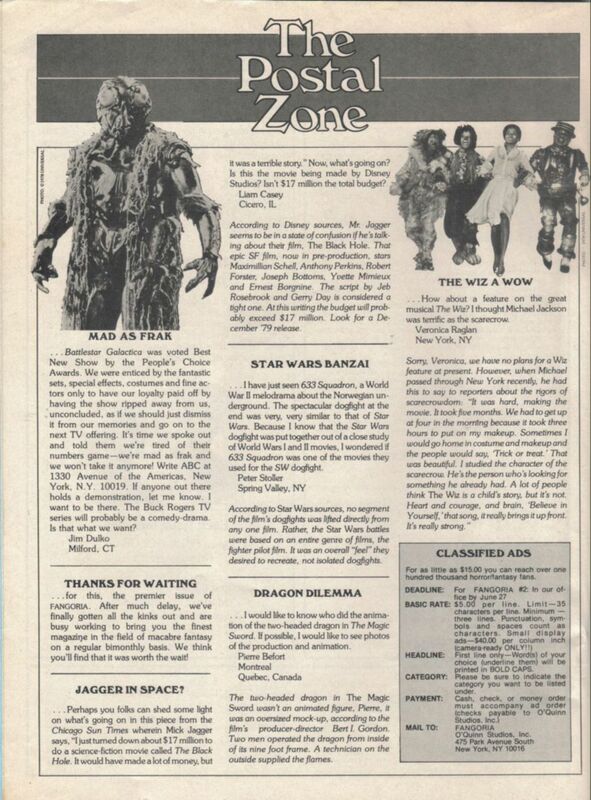 The beginning of 1982 saw the demise of SAVAGE ACTION, followed by RAMPAGE a year later. The former added the Night Raven text stories (which ultimately continued through to the demise of CAPTAIN BRITAIN monthly) whilst the latter added The New X-Men to the line-up. Looking elsewhere on the 'net, the other shocker is the stonking price rise between issues 389 (45p) and 390 (60p) which is a rampant bit of inflation. 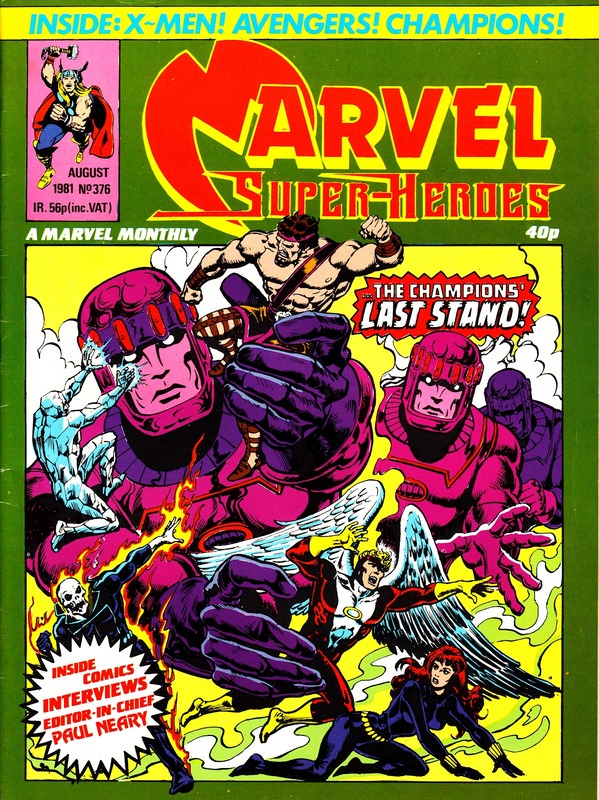 It probably shouldn't come as a surprise that sales dropped over the next seven months. 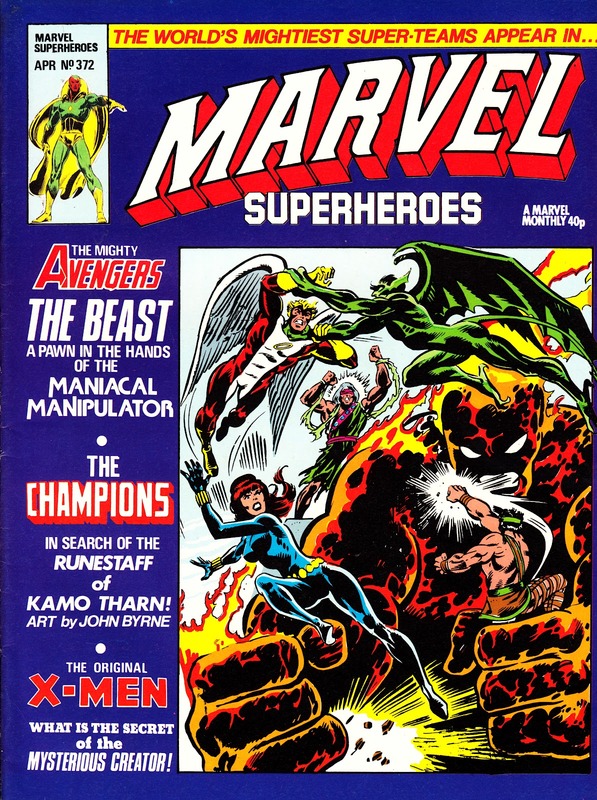 MSH didn't merge with another title and 397 is officially the final issue of the run. 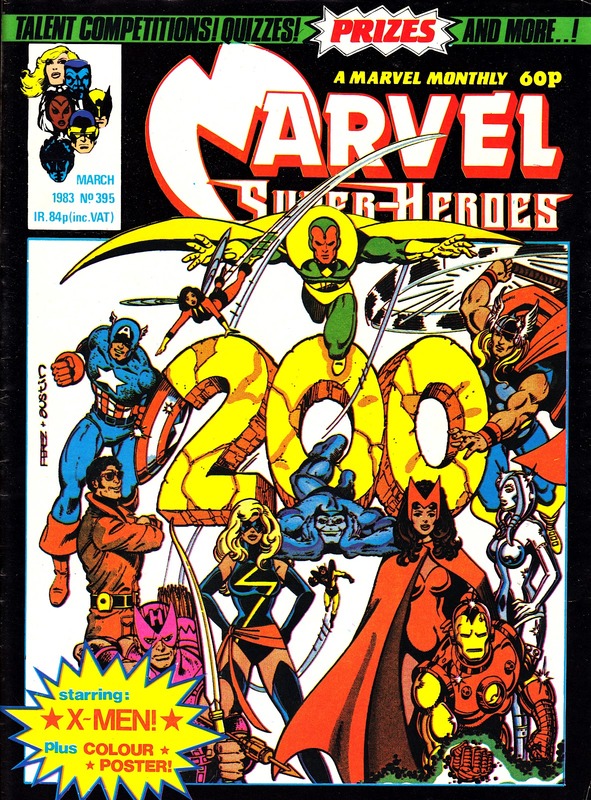 However, as THE MIGHTY WORLD OF MARVEL volume 2 launched shortly thereafter I consider that part of the MWOM > MARVEL COMIC > MSH succession. 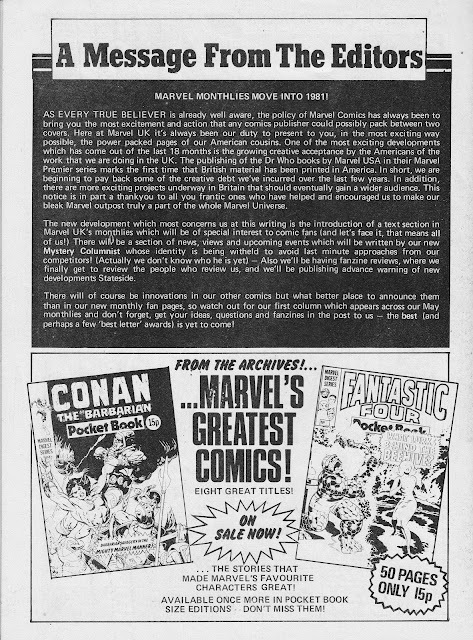 Using that logic, the run that started in 1972 eventually runs out of steam in 1984 with the merger of MWOM's second volume with (of all things) SAVAGE SWORD OF CONAN. One of the first INSIDE COMICS features in MARVEL SUPERHEROES (see my previous post) was this interview with Marvel UK Editor-in-Chief Paul Neary from issue 376. 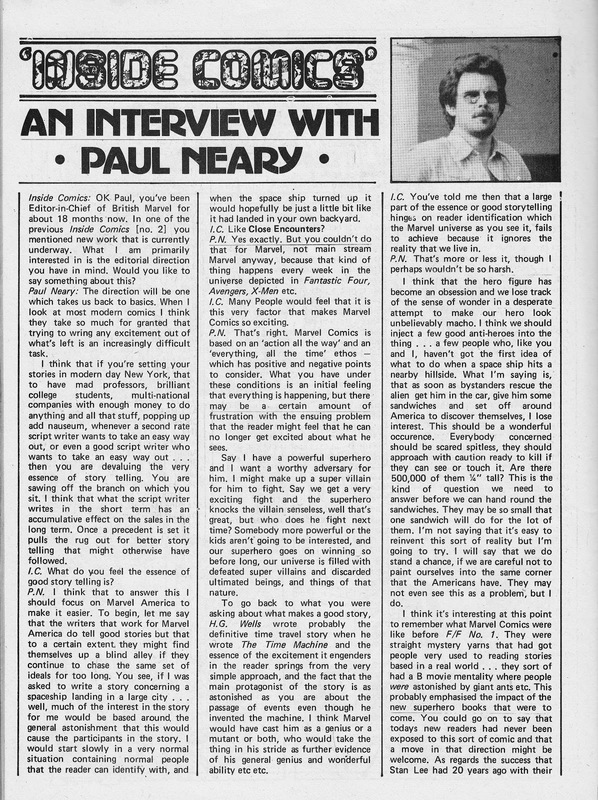 I'm always a little suspicious when media companies interview their own bosses as they're seldom more than uncritical puff-pieces designed to shift something. 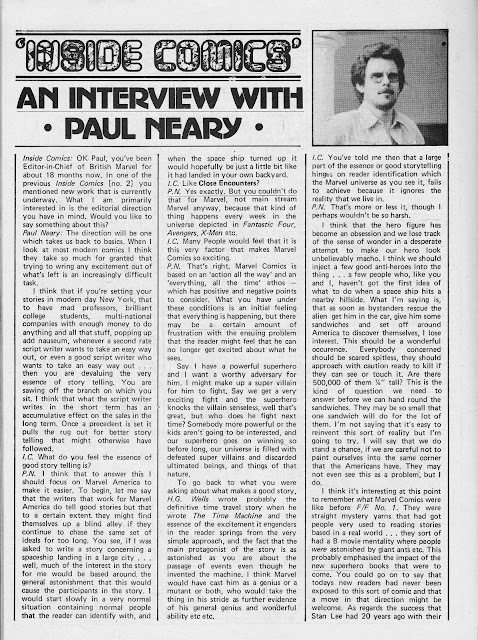 I wouldn't say this interview has many revelations but, considering how important Neary became to the history of the company in the early nineties, it's worth posting here. One interesting point is the Spider-man, Fantastic Four and 'football' strips apparently being prepared specifically for the European market. I assume all three were subsequently nixed (one wonders why you'd need additional locally produced super hero strips considering the New York office was churning them out in ever-increasing numbers) but does anyone have any information about how far they progressed? 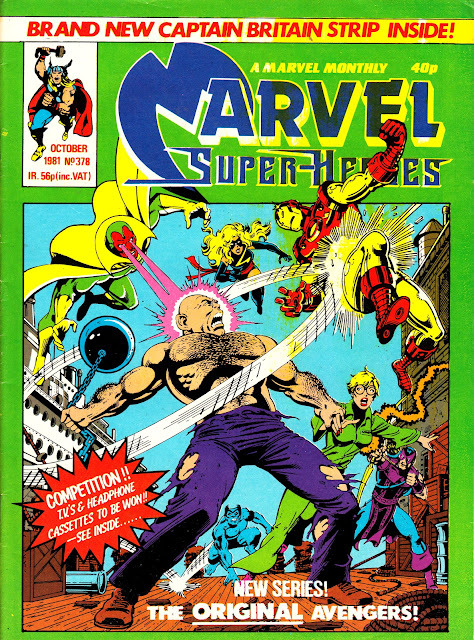 Was anyone assigned to the projects? 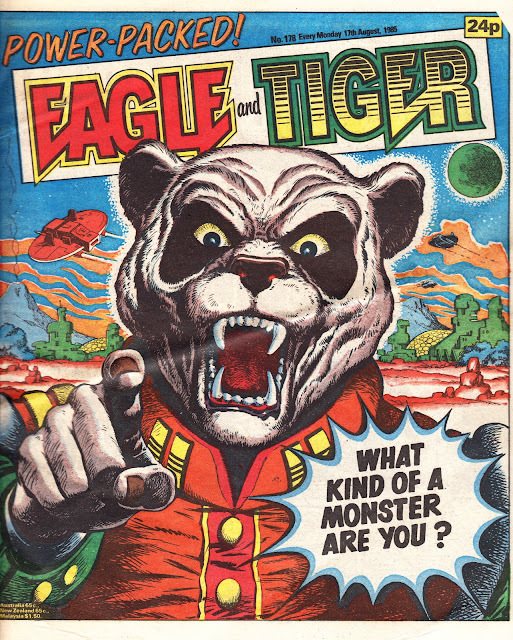 was any work completed? 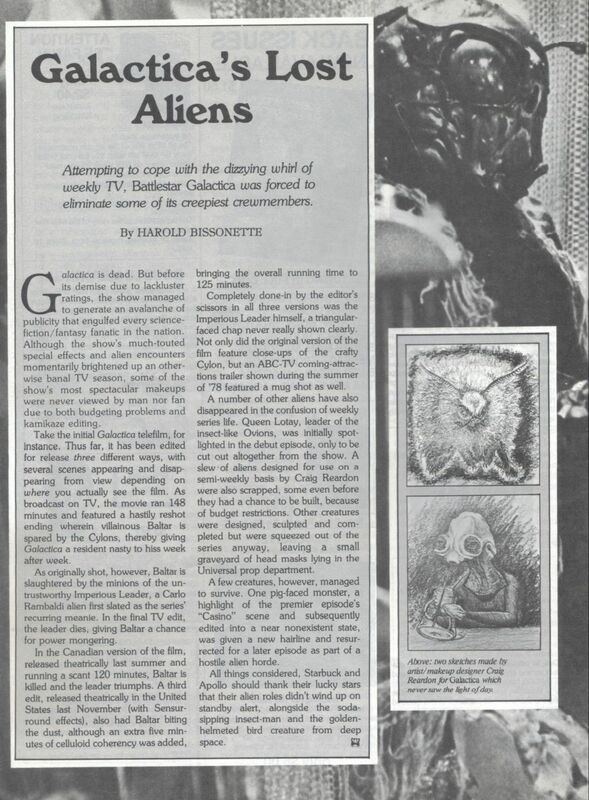 The TIME BANDITS movie adaptation DID see the light of day. British readers will remember it serving belated back-up duty in the pages of RETURN OF THE JEDI weekly. 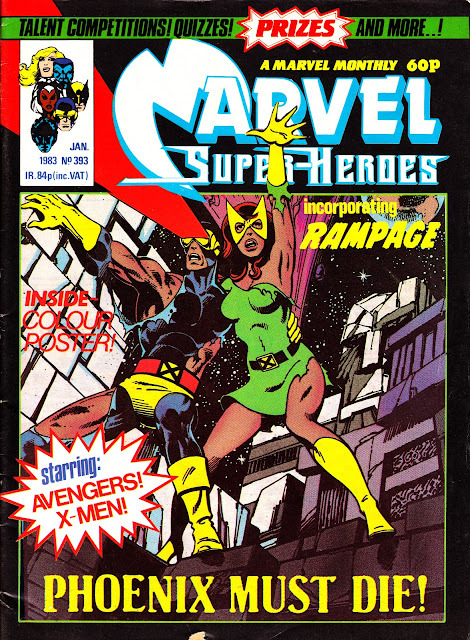 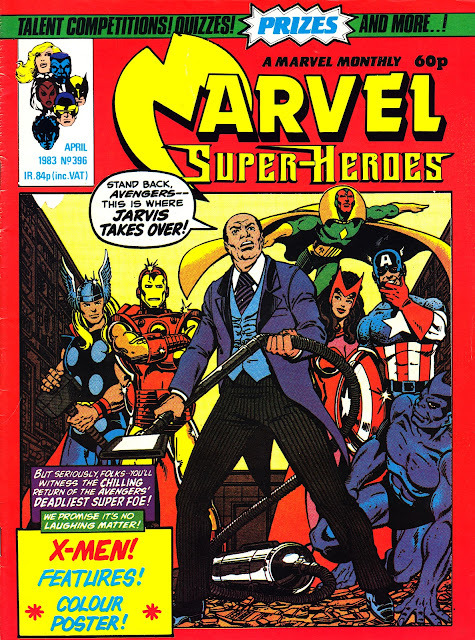 Surprisingly, Marvel UK never issued it as a one-shot special or annual. 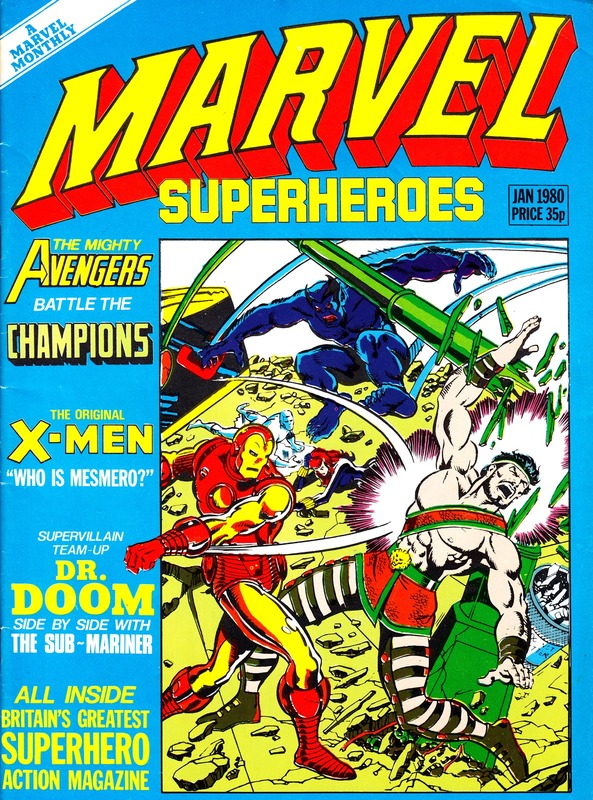 I didn't have much to say about the 1980 run of MARVEL SUPERHEROES issues... but things got MUCH more interesting the next year! 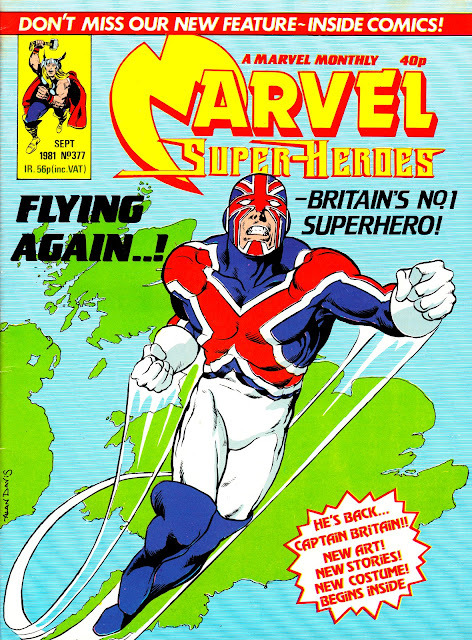 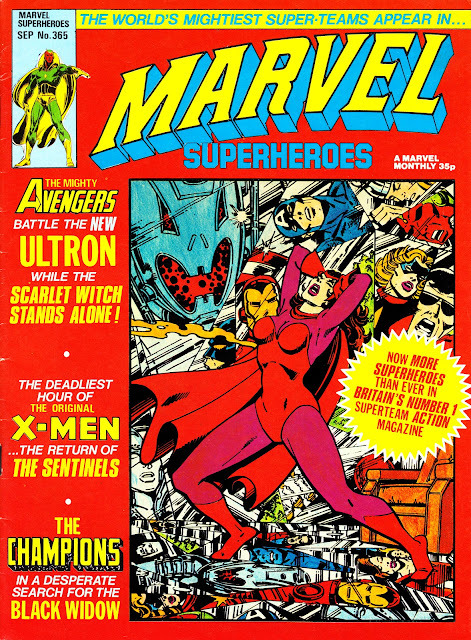 The strip line-up (The Avengers, The (Original) X-Men and The Champions) remained static through the first part of the year but the September issue (on sale in August) marked a major turning point for Marvel UK (and - to a lesser extent - the whole Marvel U): the arrival of the new (and overhauled) CAPTAIN BRITAIN. 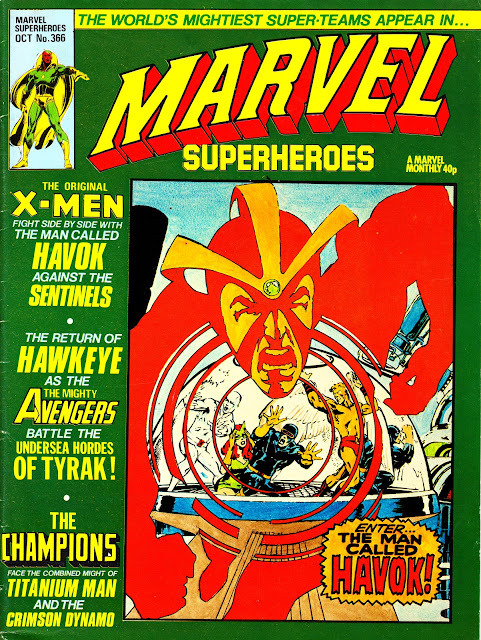 The character had been left to drift around the Marvel line since the (swift) demise of his own weekly way back in 1977. 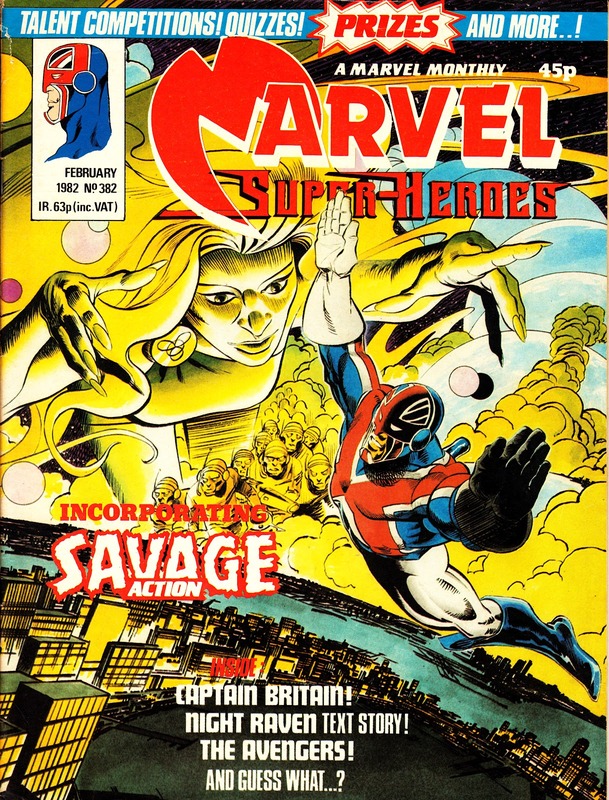 A run of new stories in SUPER SPIDER-MAN AND CAPTAIN BRITAIN weekly made way for a reprint of his US debut, a two-part story from MARVEL TEAM-UP. 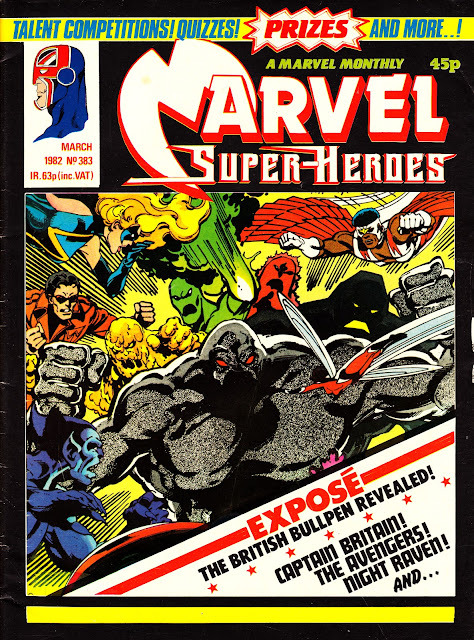 Back in the UK, Dez Skinn made him a supporting character in the UK-originated Dark Knight supporting feature in HULK COMIC (the only one of the UK created strips to survive until the title's cancellation). 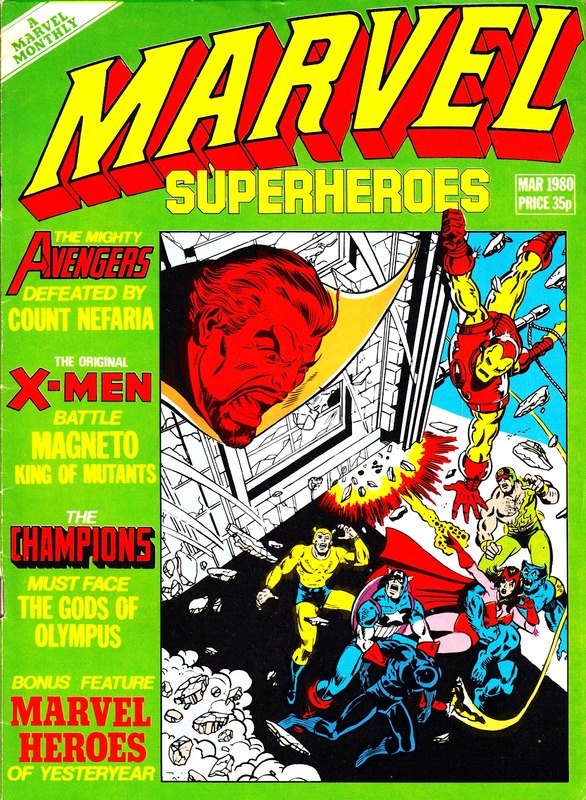 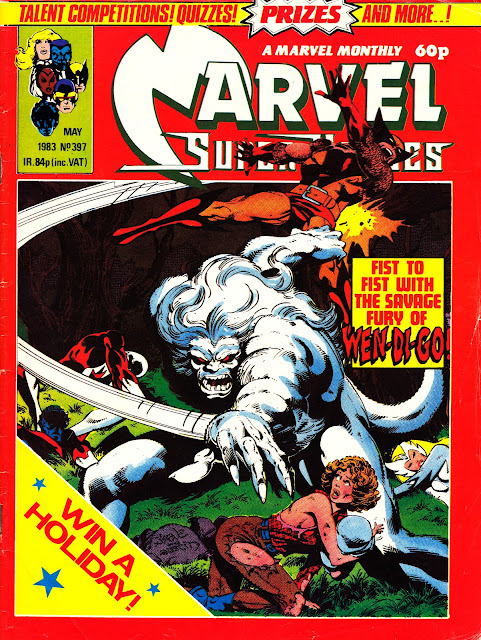 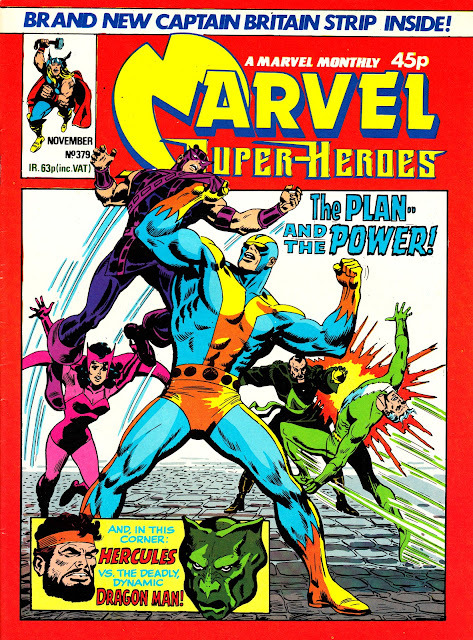 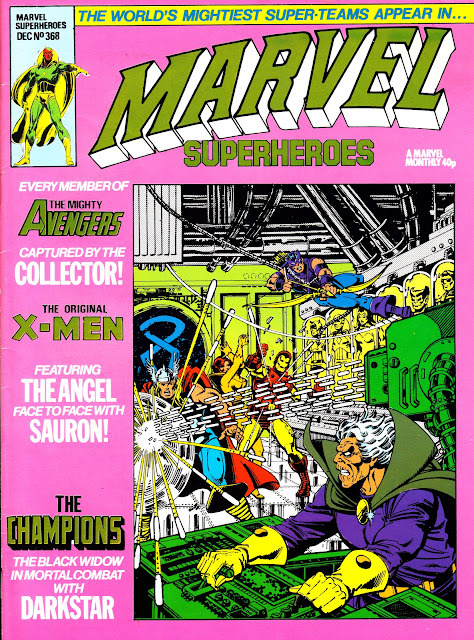 Several one-shot specials also reprinted selected material from the weekly as well as the TEAM-UP story. But Marvel Superheroes marked the beginning of his revival, and an extended run of strips that jumped about from MSM to THE DAREDEVILS onto THE MIGHTY WORLD OF MARVEL before graduating (again) to his own title. 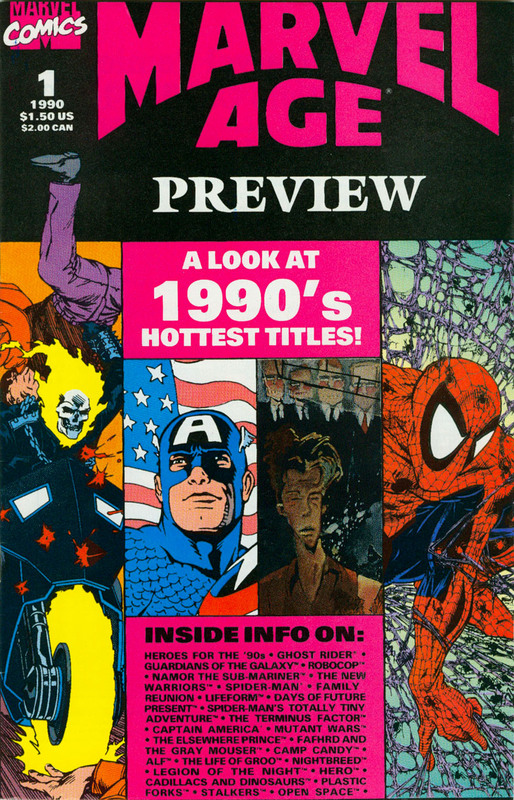 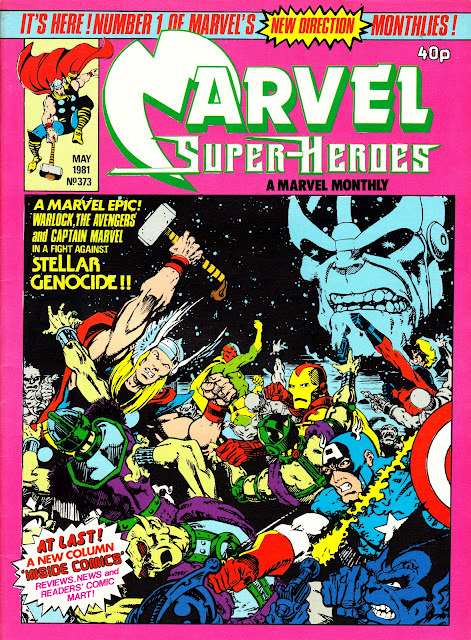 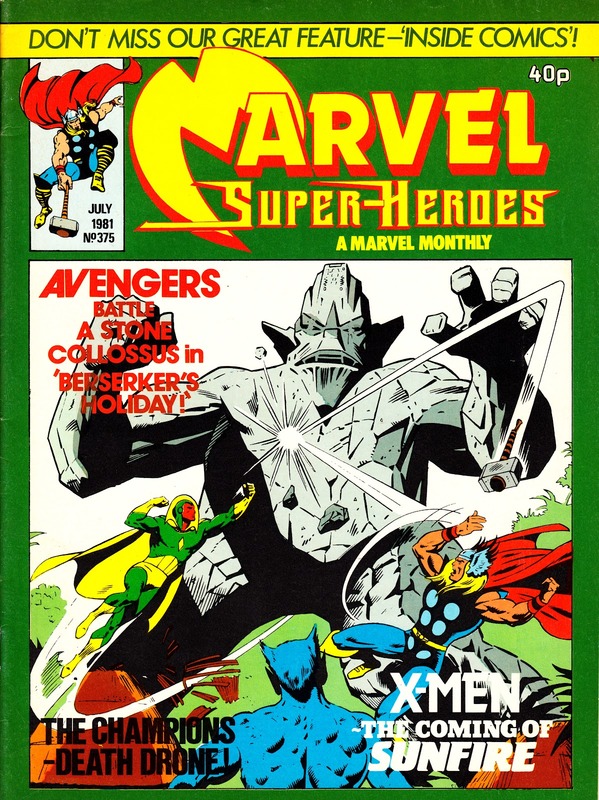 The other big innovation of the year was the introduction of the INSIDE COMICS text feature, often penned by a certain Alan Moore, that added a fanzine sensibility to the Marvel monthlies and belatedly recognised that readers might also be fans. 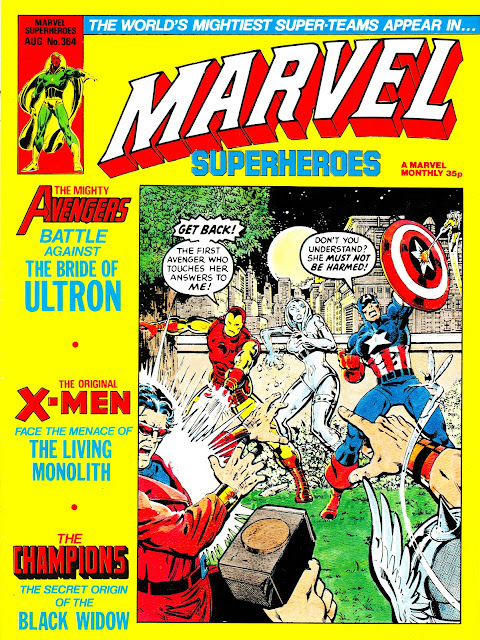 Issue 371's editorial announcing Marvel UK's refresh of the monthlies (the "new direction"), notably the imminent launch of the Inside Comics text feature, a nod to comics fandom rather than casual readers. The 1/2 page advert for the POCKET BOOKS line was also fairly rare by this point. Marvel gave them less and less plugs in the weeklies and monthlies, possibly because they knew they were living on borrowed time. 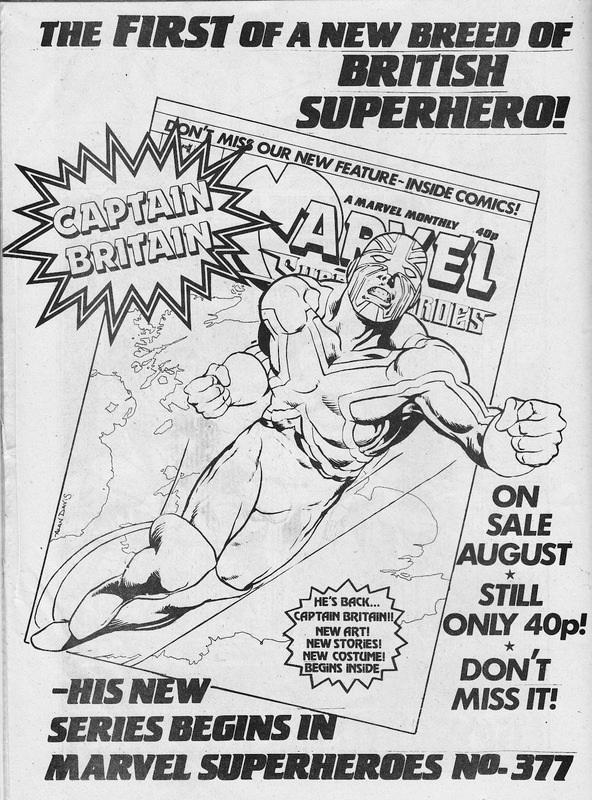 First House Ad for the revived (and revamped) CAPTAIN BRITAIN from issue 375. 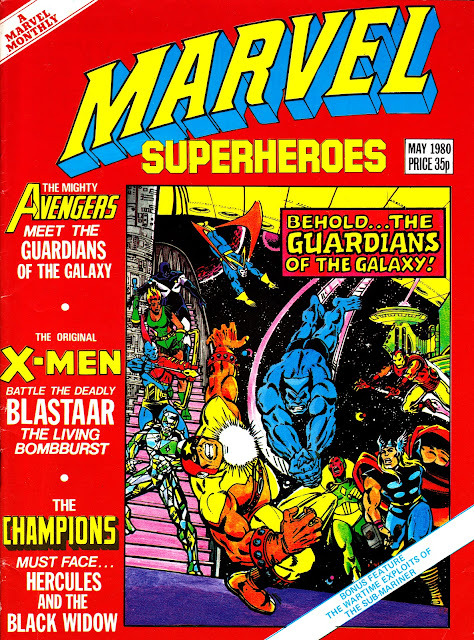 WHAT IF.... Marvel had never surrendered the Star Wars license? 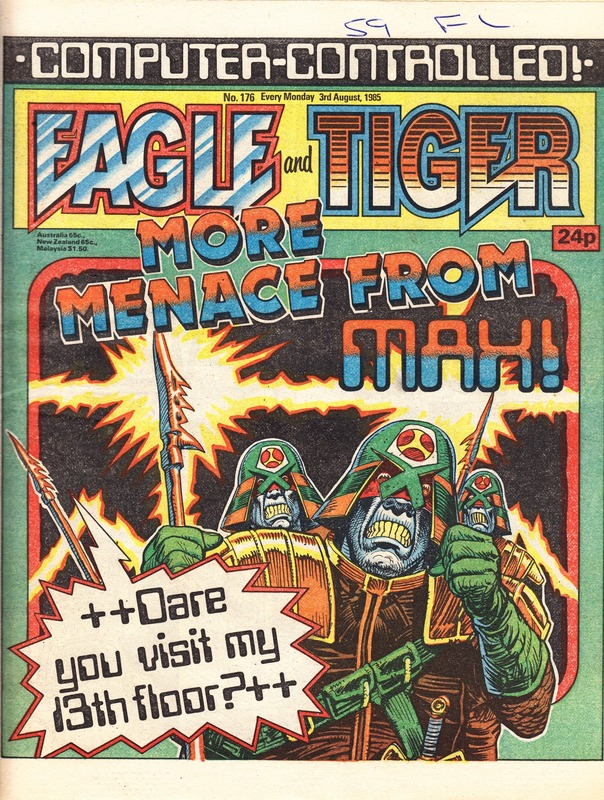 Now that Disney have bought Lucasfilm and announced an (over?) ambitious slate of new movies and TV STAR WARS projects, speculation is inevitably circulating that the comics license, long-held by Dark Horse Comics, will be shuffled to fellow Disney subsidiary Marvel. I must confess, that was one of the first things that crossed my mind (see here) when I heard the news. 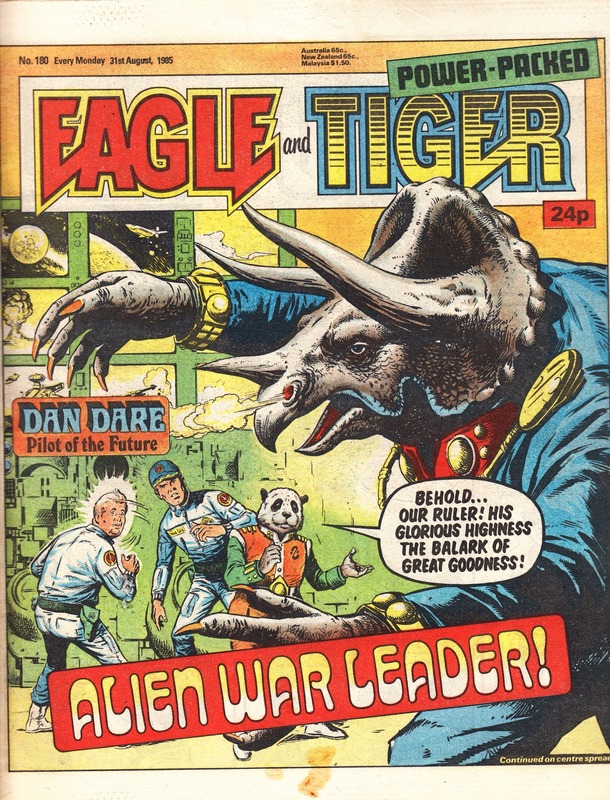 But - things could have been very different. 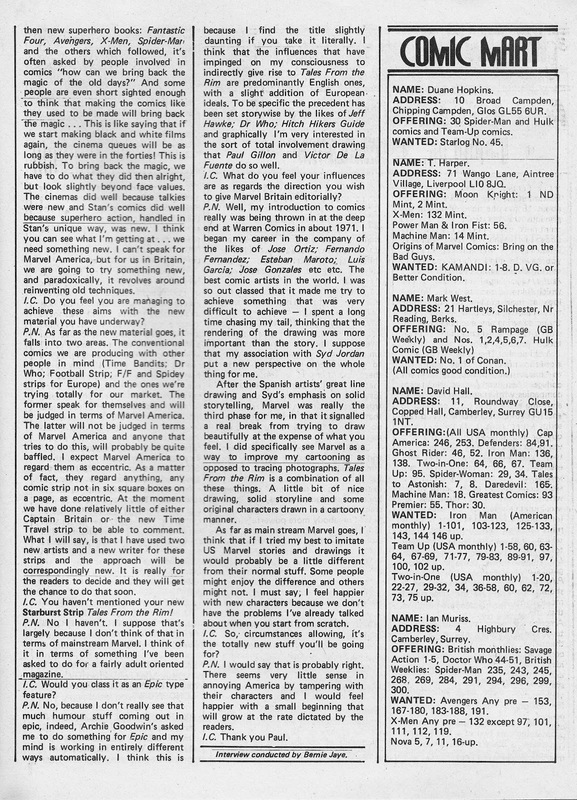 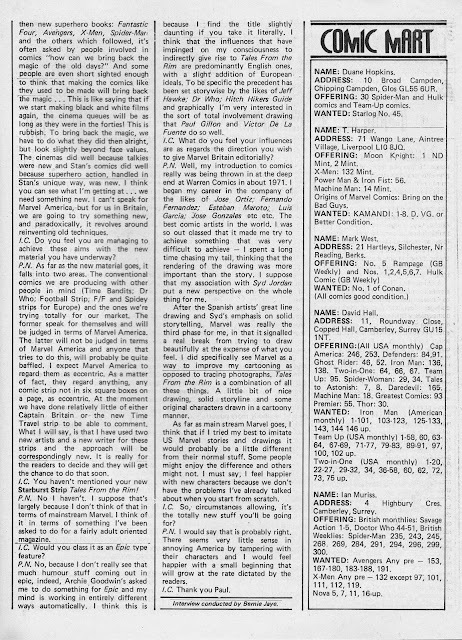 Marvel ditched the Star Wars license in 1986 on both sides of the Atlantic. Although apparently still a moderate seller (but the long-term prognosis couldn't have been too healthy), the decision was made because working with the Lucasfilm licensing department had become so fraught it was no-longer worth the publisher's time. Fast-forward to the 1990 MARVEL AGE PREVIEW (successor to the MARVEL AGE ANNUALS) and a sudden announcement that the Wars was back at Marvel. 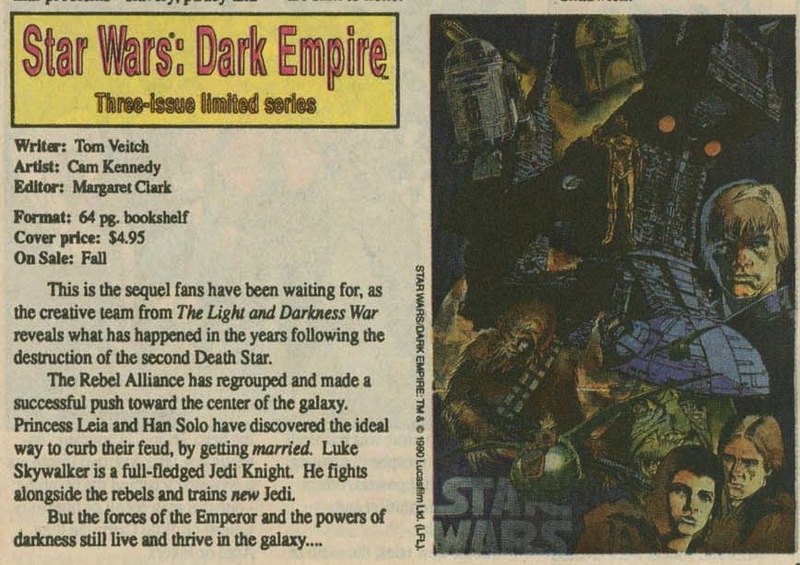 STAR WARS: DARK EMPIRE was touted as a three-issue bookshelf format limited series to appear before the end of the year. 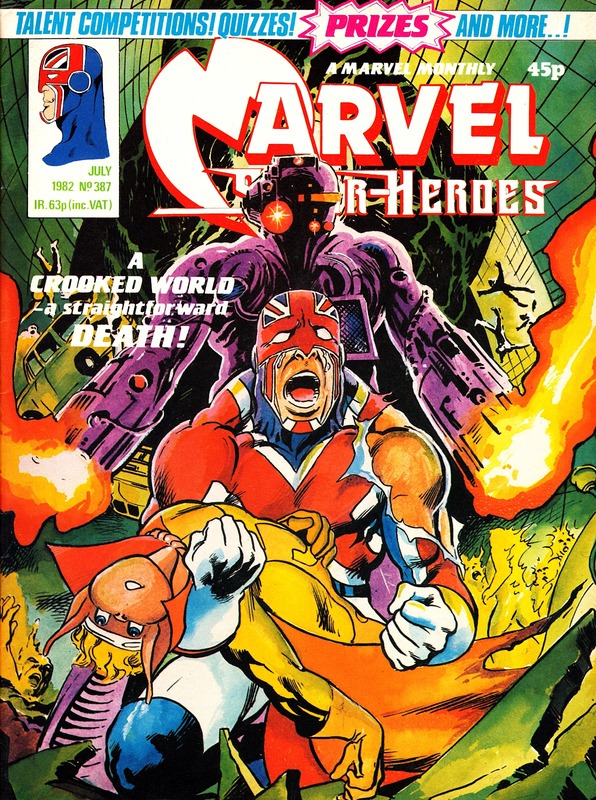 Someone - somewhere - was a little premature as the project passed from Marvel and settled at Dark Horse where it kick-started their SW publishing programme... and helped resuscitate interest in the moribund franchise. 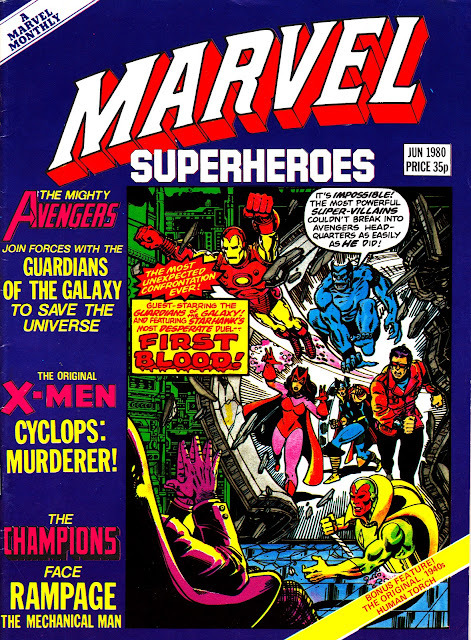 The rest - as they say - is history. 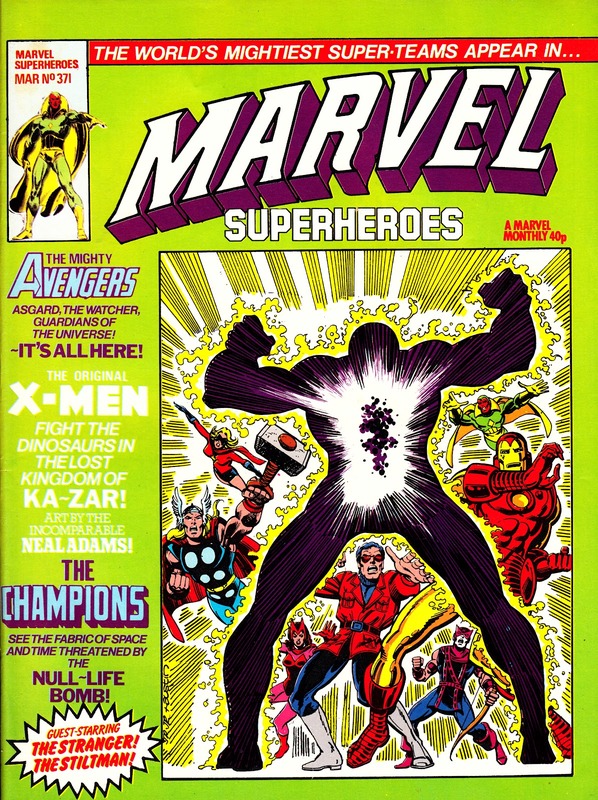 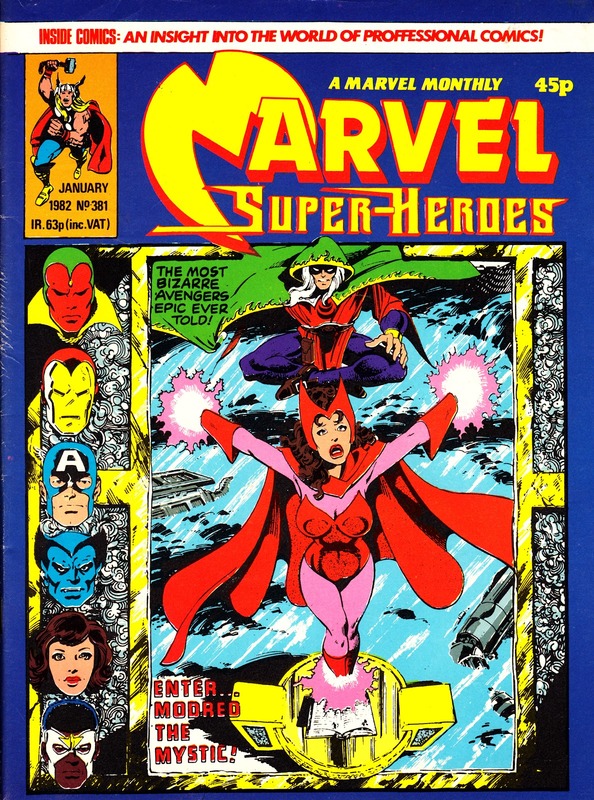 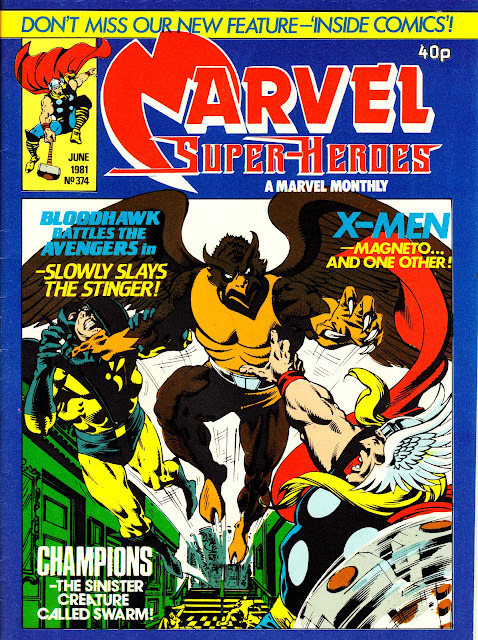 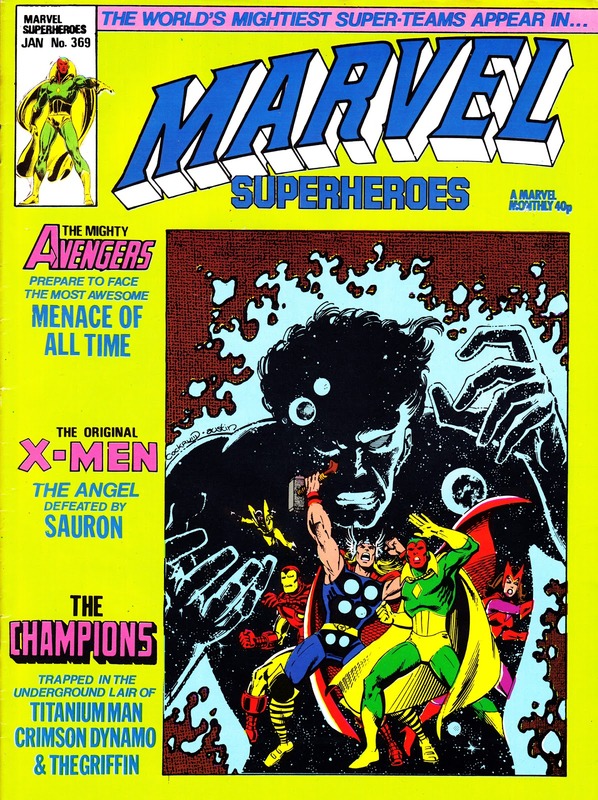 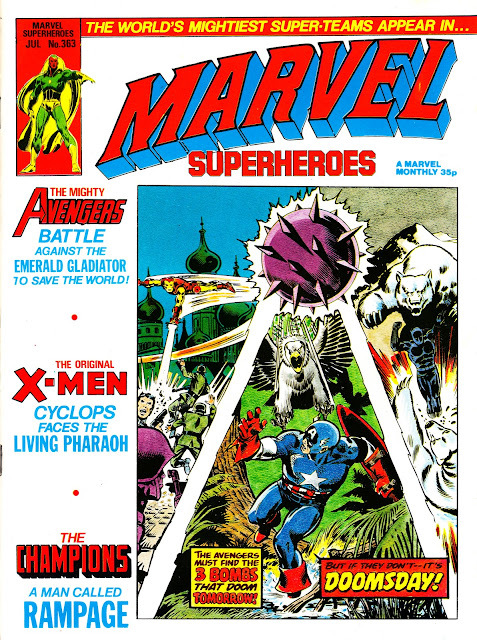 Here is Part Two of the MARVEL SUPERHEROES cover gallery, covering the twelve issues published in 1980. The highly bankable three-strip line-up of The (original) X-Men, The Avengers and (the admittedly makeweight) The Champions continued throughout the year, suppling a plethora of super-powered peeps. 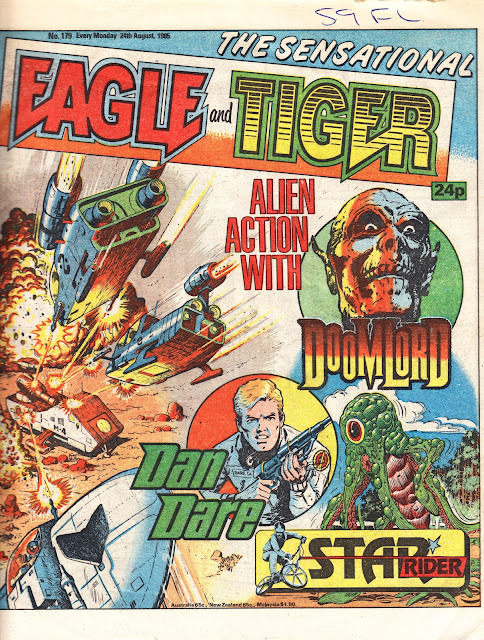 My weekly dip into the EAGLE archives continues today with a cover gallery for the copies cover-dated August 1985. I think we can safely say... 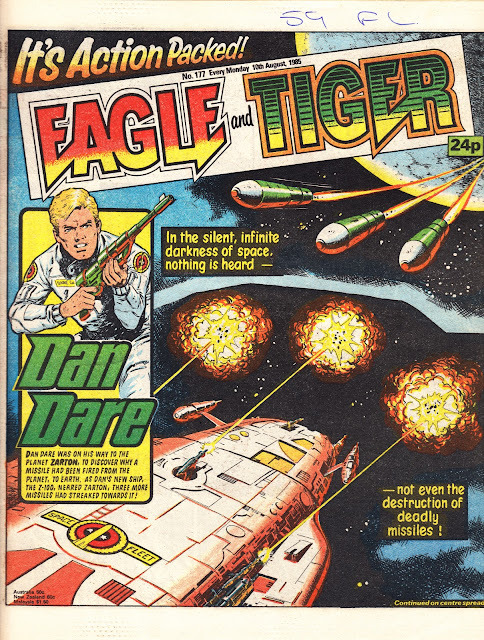 It's not Dan Dare's finest hour.